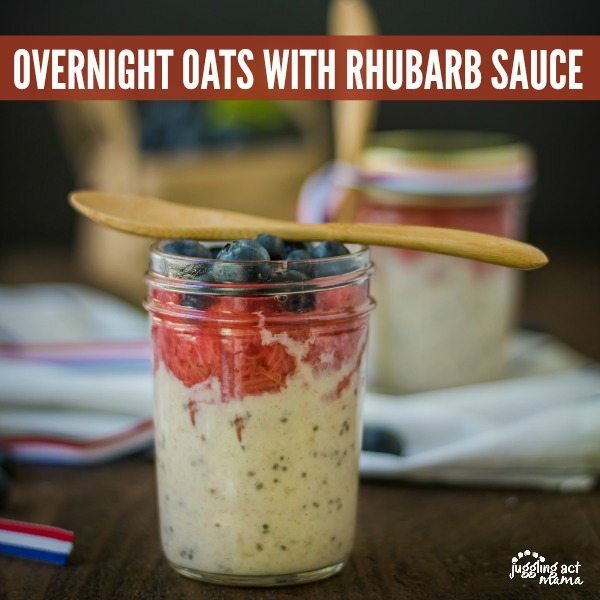 Overnight Oats with Rhubarb Sauce makes a fantastic make ahead breakfast to help with busy mornings. Summer mornings aren’t meant to be rushed and hectic like during the school year, but sometimes we can’t help it. That’s when a delicious make ahead shortcut like overnight oats comes in handy. 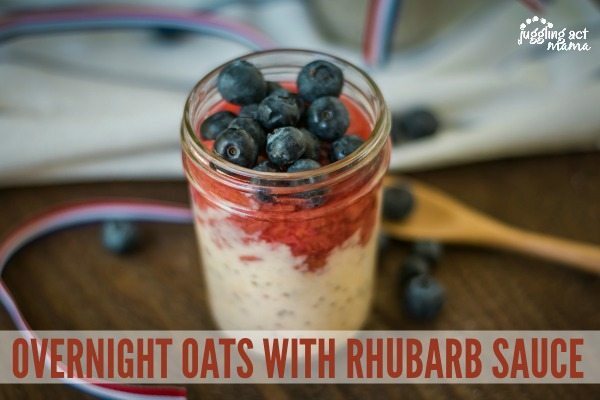 You can prep both the oats and the rhubarb sauce the night before. Mix the oats, milk or almond milk, chia sees and vanilla extract until well combined. Add in honey to taste, and mix well. Cover in an air-tight container and allow to sit overnight in the fridge. The Rhubarb Sauce is so good over this oatmeal, but it’s also delicious with ice cream, waffles, yogurt and more! In a sauce pot, bring the rhubarb, lemon juice and sugar to a boil. Lower heat, allow to simmer (uncovered) for about 40 minutes to allow the rhubarb to breakdown. Cool for 15 minutes, then cover and store in the fridge. In the morning, divide the overnight oats into 2 cups or small bowls. Add some of the rhubarb sauce and garnish with your favorite fresh berries. Enjoy! 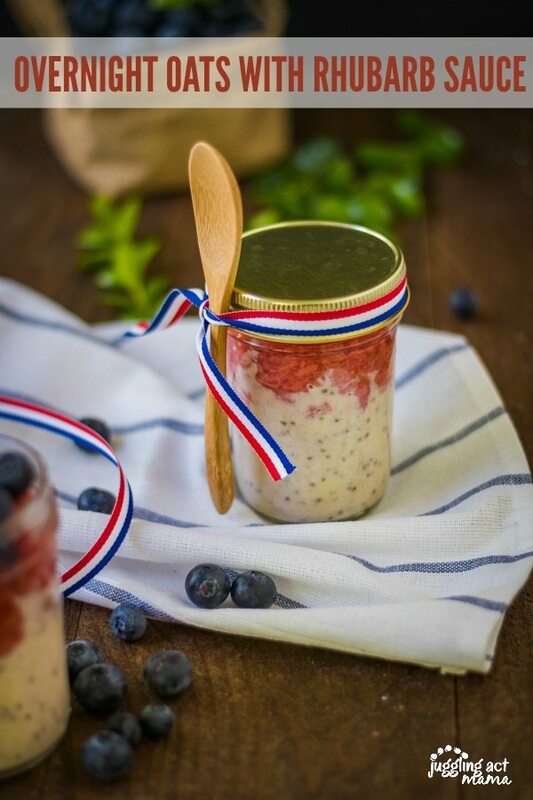 Overnight Oats with Homemade Rhubarb Sauce also make a really tasty snack or even dessert. I like to have a few plain overnight oats on hand to curb cravings. Drizzle on a little honey and some toasted almonds and raspberries for a decadent dessert that’s actually good for you! For the kids, make smaller portions with their favorite fruits on top. There are so many scrumptious possibilities with overnight oats. Get More Overnight Oats Inspiration! 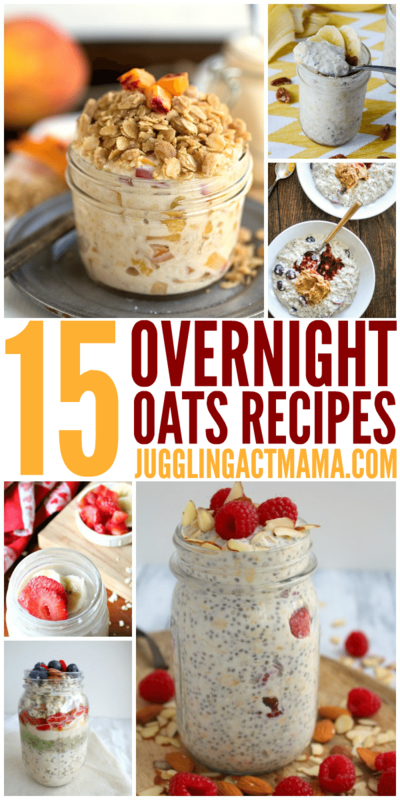 I need to try this… I’ve never made overnight oats before. Thanks I pinned it.